Anyone else watch Dexter? (warning, link has video and sound). 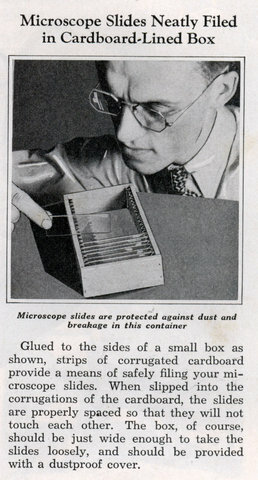 Glued to the sides of a small box as shown, strips of corrugated cardboard provide a means of safely filing your microscope slides. When slipped into the corrugations of the cardboard, the slides are properly spaced so that they will not touch each other. The box, of course, should be just wide enough to take the slides loosely, and should be provided with a dustproof cover. Hmmmm, Is that Dexters’ grand father?